SHE WAS a broadcaster, actor, cookery scribe, mother, and perhaps most enduringly of all, a writer. A feminist – smart, engaged, political and staggeringly beautiful. “People used to say: ‘You go to India to see the Taj and her’,” recounted her son Waris at the South Asian Literature Festival in London in late October. It was at the same discussion that another family member, the well-known Pakistani novelist Kamila Shamsie, revealed just how inspiring it had been to have just such an aunt. 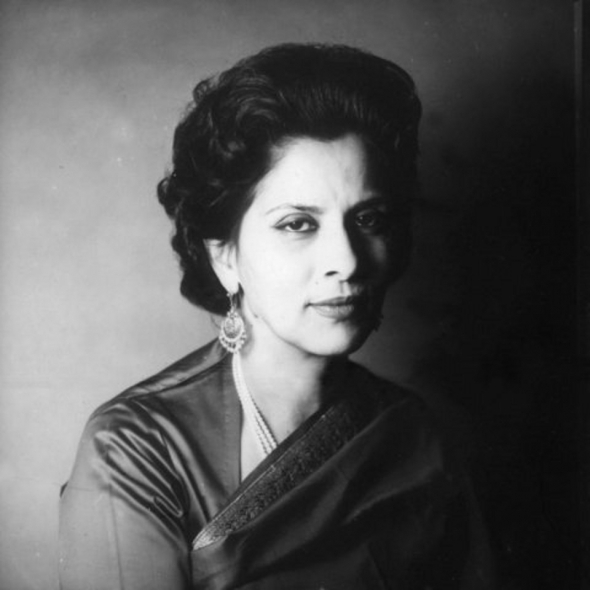 Attia Hosain’s first novel, “Sunlight on a Broken Column”, was published in 1961 to great acclaim, but little survived of her achievements and reputation in what became her home country, Britain. A reassessment of her life and work has been sparked by this being the centenary year of her birth – a new book, “Distant Traveller”, came out in India, (where her reputation has remained strong) and that talk at the South Asian Literature in Festival in October 2013, reopened a debate about her legacy. Settled in London from May 1947, Attia continued to write – setting her next novel on familiar streets close to home, but deep emotional wounds caused by Partition, (with her own family divided between India and Pakistan), and evolving family circumstances, never saw another major work of hers being published in Britain again and she died in 1998, aged 85. Her son Waris, who directed the very first episode of “Dr Who” and was the director of the BAFTA-winning global hit, “Edward and Mrs Simpson”, told www.asianculturevulture.com his mother never stopped writing, but withdrew from literary and public life. It was the only common space where she could meet her youngest brother who became a decorated Pakistani air force pilot, despite another family member being a General in the Indian army. “The only place she could meet her brother (Fouad) was in London because of the barriers between the two countries and it imbued her with incredible sadness. Everything she really loved was spliced in half, just as the country was. His mother’s first published work, “Phoenix Fled”, a short story collection, published in 1953, had been the announcement of a definitive talent and her first novel, set in 20th century Lucknow (Attia’s home), with a heroine who defies her family to marry the man of her choice, amid the ongoing struggle for freedom from Britain, had been a success. Many imagined it would be the start of an illustrious writing career – her editor for “Sunlight on a Broken Column” was none other than Cecil Day-Lewis, a huge cultural icon at the time, and the book was published by Chatto & Windus, one of the most prestigious names of its times. The latest book, “Distant Traveller”, contains two chapters of a London novel in progress – and it has tantalised critics and admirers, as it is one of the first accounts of ethnic life in Britain in the 1960s. Called “No New Land, No new seas”, it charts the trials and tribulations of ‘Murad’ as he negotiates London life in the 1960s and comes to terms with the death of a dear friend and kindred spirit in Isa, who leaves behind a grief-stricken wife and 12-year-old son. It deals frankly with love and sexual relations and the early pages are an incredible window into life for Asians at that time. From these early pages – discovered and annotated by her children, Waris and his sister, Shama Habibullah (their father’s family name), it is not difficult to appreciate the vitality, intelligence and enterprise of Attia as a novelist. It is rich without being dense, sharp without edge or malice, and hugely perceptive and powerful on the cultural shifts, both large and subtle, which the characters had undergone and were continuing to confront in their bid for survival. It would have been a major work but also fun, revealing and entertaining – a bit like episodes from Attia’s own life. The family had settled in London when Waris’ father was part of the Indian diplomatic service and was responsible for the trade of cotton between the subcontinent and Britain. When Partition occurred in August 1947, his father returned to India and set up privately, while the family remained in London and Attia got a job to sustain herself, while her husband paid for their children’s private education. Politics undid her there eventually after five years – some raised a fuss about a Muslim woman broadcasting to India. “She did very well, but as the conflicts between the two countries intensified there became a conspiracy on the part of some who objected to her presence as a Muslim, saying she should only broadcast to Pakistan. Yet, as one door closed another opened in 1961 – this time in a play, “Bird of Time”, about an English couple settled in Kashmir, but marooned there after Partition. “There were very few Asian actors at the time and someone had phoned the BBC,” said Waris, taking up the story. “Someone had suggested my mother and they had phoned and had asked her to audition and she had turned it down. “I was furious, I said: ‘I am going to take you’. I dragged her along to the Savoy Theatre in the car. At the audition, she was made to read from a sheet of paper, and she did it splendidly, but was told to project her voice more. She got the part of the wife of the governor of Kashmir. This was no small production and contained a couple of leading lights, including Diana Wynyard CBE, who had enjoyed a Hollywood career, and was playing an Anglo-Indian. However, after this she more or less retreated from active public life, making the odd appearance at literary festivals, but didn’t care much to promote herself or her work. “It was a kind of mental decline,” conjectured Waris, raising the possibility that she might have been depressed. So much so, she made Waris drive her to Southall, an outer western suburb of London and known by many as ‘Little India’ because of its high concentration of Indian immigrants, largely from the Punjab. “She wanted to meet these Punjabi women but here’s the rub – you turn up from Chelsea, looking the way you do and you only speak Urdu and they don’t, and these women come from rural Punjab and they just looked at her as though she was on another planet. “She said: ‘I went to the villages’, but she went there as the daughter of a feudal landlord and I had the feeling these women did not want to be patronised. Yet she also was a pioneer in her own way, better sensing the shifts in tastes and the points at which different cultures were engaged in a more easy dialogue. Attia had been born into a world of privilege and position in Lucknow in the early 20th century. Her family were landowners and very much part of the fabric of the city’s aristocracy – which was among India’s most venerated and respected. For centuries, Lucknow had been a capital of culture, and of the arts, patronised and supported by the highest echelons of Muslim society. “It was a seismic shift from the privileged life she’d lived to being a housewife (in London) with two children at boarding school. “We had a one-bedroom flat in Sloane Avenue, and my mother and sister shared a bed and I used to sleep on a cot bed. “She had to teach herself to cook – for years she could only do boiled eggs and chips with ketchup, but then she learnt and brought out a cookery book in 1967 with Sita Pasricha, on how to cook simply, called “Cooking the Indian Way”. It seems a little sad that a woman with such a rich life and talent should have faded so grandly, and that one of the early icons of British Asian life is no longer recognised or celebrated much. Waris has a theory and it seems convincing, especially when you consider his mother’s family and how they were brought up. “We come from Lucknow and we were always brought up to be ultra polite…‘Pehle Aap’, literally, you first…we were so busy saying, ‘you first’, we never got through the door – that’s us,” Waris chuckled. “There are certain other areas of India where people know how to promote themselves. Perhaps an Indian-style ‘Downton Abbey’ could remind all Indians of the glory and richness of Lakhnavi life and how brilliant it was in a country that from some angles appears too keen to erase its own long rich Muslim history and culture. ‘Bhagavad Gita’ – ancient text, modern mores?? Hiya, good online site you’ve at this time there. Thanks a ton! This is definitely an very good online site. Quite educational….looking forward to coming back again. That would be the end of this write-up. Here youll come across some web pages that we believe you will enjoy, just click the links. We like to honor numerous other net internet sites around the internet, even when they arent linked to us, by linking to them. Under are some webpages really worth checking out. mrinovuuumq,If you are going for best contents like I do, just go to see this web page daily because it offers quality contents, thanks! ukxxlc,Some really nice stuff on this website, I enjoy it. qjulwe,This website truly has alll of the information and facts I wanted about this subject and didn?t know who to ask. nzqwol,Some really nice stuff on this website, I enjoy it. lypkxjmz,Quality blog, keep up the good work. You may check our website also! mlaacahrjo,If you have any struggle to download KineMaster for PC just visit this site. royfxgtaqox,This website truly has alll of the information and facts I wanted about this subject and didn?t know who to ask. iqcuvedj New Yeezy,Waw! Its really great and wonderful ever i found. Thank you for sharing this info. evyvmmnfl Yeezy 350,This website truly has alll of the information and facts I wanted about this subject and didn?t know who to ask. teqxkrjyn,Waw! Its really great and wonderful ever i found. Thank you for sharing this info. csmslsi,A very good informative article. I’ve bookmarked your website and will be checking back in future! dldledht,This website truly has alll of the information and facts I wanted about this subject and didn?t know who to ask. ceugime,A fascinating discussion is definitely worth comment. I do think that you ought to publish more on this topic, it may not be a taboo bglblstskrd,subject but generally folks don’t talk about such subjects. To the next! All the best!! acghdj,If you are going for best contents like I do, just go to see this web page daily because it offers quality contents, thanks! fvkotfxidyx Yeezy,Very informative useful, infect very precise and to the point. I’m a student a Business Education and surfing things on Google and found your website and found it very informative.